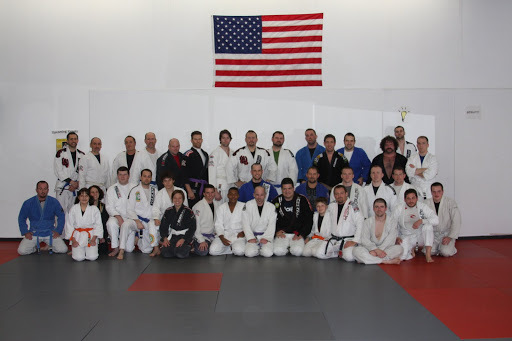 Rigan is the guy in the front row with the Black Gi jacket. The one that looks like he could make you tap as you read this. Somewhere along the lines during what is just the infancy stages of my gym tour I can't help but feel a strange (if not flimsy) similarity to the quest that Hunter S. Thompson partook in his book Fear and Loathing in Las Vegas. Would I require means by which to expand my consciousness in order to find whatever it is that this trip is leading me to? At some point would I try to purchase an orangutan? Would I too spend days without sleep while taking my mind and body to the very limit? No, probably not. I'm just a dumb ya-you-betcha from Minnesooooota that likes to roll. The closest thing I get to high is when I hold out on a rear naked choke too long. For my second stop on my Minnesota BJJ gym tour, I walked through the doors of McCune's Martial Arts in Brooklyn Park, MN (formerly the less friendly sounding No Rules). McCune's is home of Chris McCune. He is a 1st degree Black Belt under legendary Rigan Machado. And he's a World Champion in BJJ. Actually, he is the only black belt BJJ World Champion in Minnesota. This actually brings me to an interesting point about being a martial arts instructor, especially in the someone misfit sport of BJJ. Your reputation is always on the line. Whether you are a blue belt or a black belt, if you are teaching students (especially if you are making them pay dues) you are always presenting yourself as an authority. Granted, as you progress in the ranks, it is safe to assume that you know what the **** you are talking about. However, the idea of competing stops sounding as appealing when your students might be there to watch. What if you lose? And what if you lose to a rival instructor? Does that make them better than you? Should your students leave and train somewhere else? These are rational concerns that keep a lot of instructors off the mat. We don't exactly have the same numbers as baseball, basketball and football. Students can be hard to come by and harder to keep coming in the door. So, believe me, I understand not wanting to compete. But at the same time, I respect those that still put it out there even more. In the last two years Chris McCune has won both a Grappler's Quest Absolute title and an IBJJF World Championship (the latter he won by defeating 4th degree black belt and World Champion Mica Cipili). But titles aren't everything. There are plenty of people out there that are great in competitions that couldn't teach you to tap out, let alone complex variations on movement. Having studied under the likes of Rigan Machado, Mica Cipil and Chris Haueter, he has absorbed decades worth of information and training styles that are still being put into affect (particularly by the Cipili and Haueter who continue to win World Championships to this day). With a sense of humor and what is an honest love for the art and teaching, McCune brings an openness on the mat that shows through in his students. Even his purple and brown belt students are will to talk, train and teach the newest students through the door. After the technique classes, during open rolls (I believe to the sounds of the Foo Fighter's newest CD), McCune is on the mat with his students as they work round after round of techniques with their own incentives. The atmosphere is light-hearted, but the technique is as solid as they come. McCune is also a 8th degree Black Belt (Master Rank) in San Soo. A form of kung fu that some of his students have so elloquently dubbed "back alley kung fu". I know first hand, that is a polite way of saying it. This ain't the stuff Daniel-san trained with Mr. Miagi. Man, two-for-two on gym reviews. Can't wait for the next stop! Shameless Plug: Check out the website HERE. MENTION THIS ARTICLE AND GET 15% OFF ANY NEW BJJ MEMBERSHIP. ACT NOW! THIS OFFER WON'T LAST! If you would like your gym review on this site by a writer with only minor psychological issues (mostly just an Oedipal Complex) please feel free to contact me at chokingminnesota@hotmail.com or send a message to Choking Minnesota on Facebook. See you on the mats!